This post shows how to encrypt and decrypt string in ASP.NET Core. Lately I’ve been working with ASP.NET Core. The .NET Core moves things around a little bit, at least until .NET Standard 2.0 arrives. Here’s some simple code which I’ve been using to encrypt and decrypt a string in ASP.NET Core using a static key. 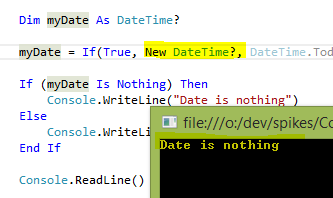 Azure’s REST API requires Date or x-ms-date header. As specified by HTTP protocol, the Date (or x-ms-date) header must be in RFC 1123 format. Perhaps the easiest way to get the current date time in RFC 1123 format is through the http://http-date.com/. This web tool, created by Leonard Wallentin, provides not just the current date time in correct format but also "30 days from now" and “365 days from now". The tool has proven itself really useful in the last few days when working with the Azure blobs using the REST API. 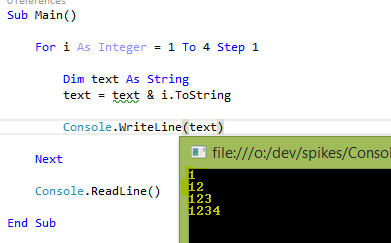 Recently I blogged about the VB.NET String Concatenation Weirdness. That’s not the only thing which can hit you if you mainly code in C#. Here’s an another example, as pointed out by my co-worker Panu Oksala. This time the weirdness is related to If and nullable fields. The following StackOverflow question contains more info about why this is happening. 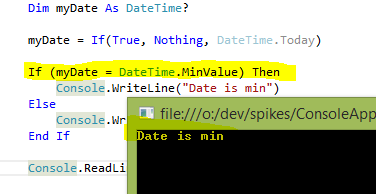 Variable 'text' is used before it has been assigned a value. 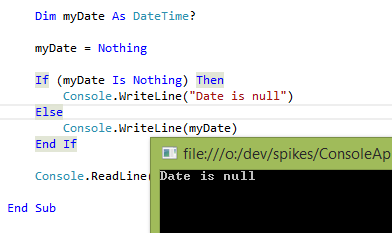 A null reference exception could result at runtime. Still, this can cause interesting issues if you don’t play close attention to compiler warnings. I blogged about VB.NET’s IIF-statements few years ago. As I mentioned back then, they are a handy way to shorten the code and to make it more readable but also a great way to introduce subtle bugs into our systems. Here’s the part 2 two that blog post, dealing with If statements and nullable variables.